Combine Sidebar + Extensions bar? I've got some extensions in the sidebar, but they appear in a second bar, not in the main body sidebar. Is it possible to add this extensions to it? It's already being asked in Suggestions Box. i am agree with you, latest Opera sidebar still feel wasting space. need to put extention icon there. Extension icons are in the main toolbar. Would you want to move those? I second that. Doubled sidebar is a waste of space and sidebar extension icons should be listed below in the same column. Sincerely hope they move extension bar to Reborn UI. Unify the sidebars - two sidebars like that isn't practical. Visual on/off toggle even when sidebar not showing. Vertical bookmarks bar - This would likely be a button functionable from sidebar. Current bookmarks bar - please add visual on/off toggle - I would use bookmarks bar if it wouldn't be on the way all the time, takes much screen real estate. How about to put extensions to main browser bar? It has been requested by some people since navigation sidebar was introduced. I think it would be nice to have them merged but I don't see it happening soon. I hope the two redundant sidebars will be merged soon. In addition, an auto-hide option to show de sidebar only when the mouse is placed on the left side of the screen (like in tha "All In One Sidebar"firefox extension) would be welcome. just get rid of the extension sidebar altogether. @chuchkyschild I agree. The extension side bar needs to be gotten rid of. a merge would be fantastic. with the option to add web panels and extensions that would be a well done implemented and functional "all in one sidebar". But as long the merge is not gonna happen soon, i would like to be able to keep the extension side bar. an option to hide it is already existent. so it's up to the user wether to display and use it or not. @rudrick i am sure, this is something being considered. 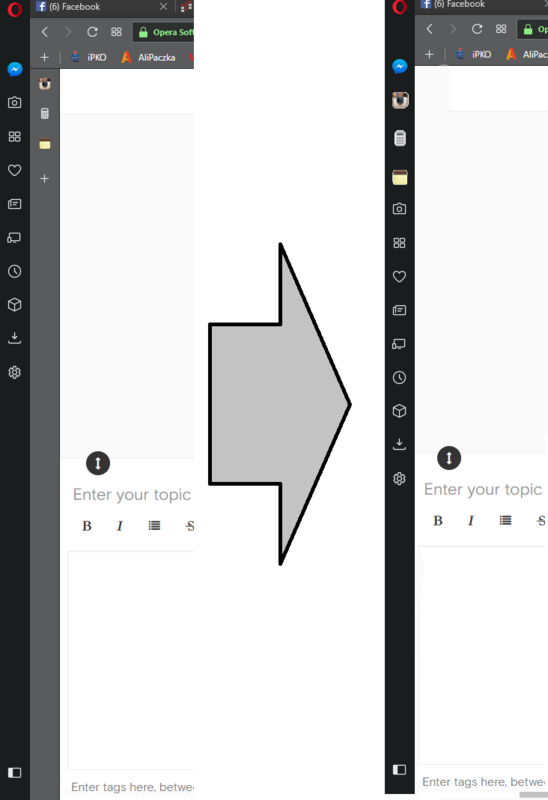 seeing how elements from concept browser neon have been integrated, merging sidebars and/or adding additional options such as move it to main bar, have it as drop down menue etc, i assume, are being considered as well. It probably comes down to... agreement they have with FB, VK etc - as Opera have been heavily pushing monetization across clients. The messengers have exclusive access to Reborn sidebar as well as web panel. But users want to be able to use addons on sidebar as well as web panels without restrictions. @rudrick yes! totally agreeing on web panels for common use! was just trying to get the updated version from github, but it says it couldn't load it properly due to manifest missing? @rudrick ah, thank you mate totally overlooked that. The concept that a browser can have two sidebars is ridiculous. Come on Opera. You can do better. Lay off the Virtual Reality nonsense and get back to basics.